DEAUVILLE, France (AFP) – The world's great industrial powers met Thursday at a G8 summit dominated by revolt in the Arab world, backing the popular struggle for democracy and seeking a way out of the Libyan war. Russia said it had been contacted by Libyan strongman Moamer Kadhafi's prime minister seeking to negotiate a deal, and had been asked by Western G8 partners to pursue contacts with the regime to seek to resolve the conflict. 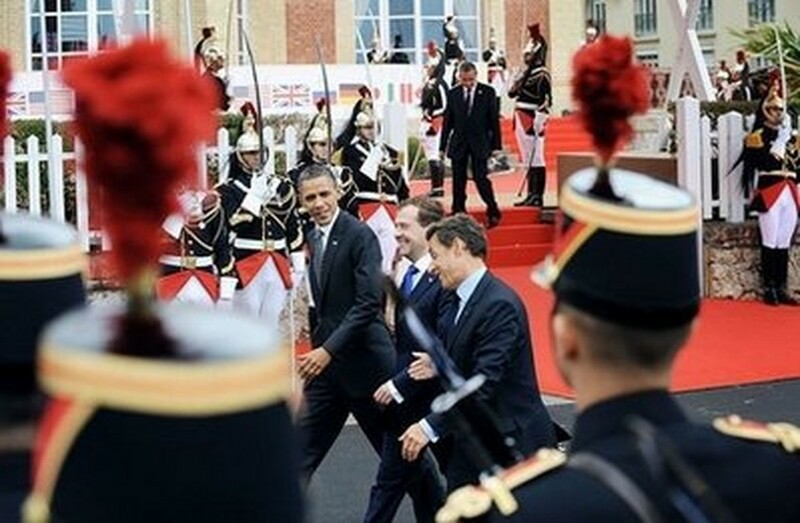 AFP - US President Barack Obama (L) and Russian President Dmitry Medvedev (C) are greeted by French President Nicolas Sarkozy at the Centre International de Deauville. Western officials said Moscow had not been formally asked to mediate, but a US official said President Barack Obama had discussed maintaining contacts with Tripoli with his Russian counterpart Dmitry Medvedev. News of Moscow's diplomatic gambit came after President Nicolas Sarkozy of France welcomed the G8 chiefs to the windswept Normandy resort of Deauville for two days of talks on the world's great diplomatic and economic challenges. According to a draft version of their planned declaration, seen by AFP, the presidents and prime ministers were to call for an end to violent repression in Libya and Syria and for immediate Israel-Palestinian peace talks. They were expected to agree a statement backing a limited government role in policing the Internet and boosting global nuclear safety standards in the wake of Japan's devastating tsunami-triggered nuclear tragedy. Sarkozy, whose supermodel wife Carla Bruni provided the day's other talking point by appearing in a loose dress that showed off her hitherto unconfirmed pregnancy, said the G8 would discuss imposing tougher sanctions on Syria. The leaders, including Obama and British Prime Minister David Cameron, also took time out from summit business to congratulate Serbia on the capture of Europe's most wanted war crimes suspect, Ratko Mladic. "Requests have been voiced that Russia take upon itself the role of a mediator in settling the situation in Libya," Medvedev's spokeswoman Natalia Timakova told reporters. Timakova said that the requests were made during bilateral talks between Medvedev and Sarkozy and Cameron. A US official said Obama had talked with Medvedev about his staying in touch with and having contacts with the Libyan regime, but was cool about the notion that Moscow would take a lead role in mediation. He said they did not talk about a specific ceasefire proposal. A spokesman for Cameron also distanced Downing Street from the idea Russia had been asked to mediate, saying: "That's not something that we recognise." Russian Foreign Minister Sergei Lavrov's office said he had spoken by phone with Kadhafi's Prime Minister Al-Baghdadi al-Mahmoudi earlier Thursday and he also asked Moscow to mediate a ceasefire. "Tripoli's representative came forward with a request to help achieve agreements on a ceasefire and the start of talks without pre-conditions," the foreign ministry said in a statement. Russia has been less keen to intervene in the case of its traditional Middle East ally Syria, but Sarkozy said he would push all members for tough action. "Clearly, the question of strengthening sanctions against Syrian leaders needs to be asked, because the violence being used against demonstrators is unacceptable," Sarkozy told reporters after the first summit sessions. "There will be discussions about this tonight," he said, before heading to a waterfront restaurant to host a working dinner with fellow leaders from Britain, Canada, Germany, Italy, Japan, Russia and the United States. Bashar al-Assad's Syrian regime is engaged in a violent crackdown on unarmed pro-democracy protests, fearing they will build into successful revolutions like those that swept away autocracies in Egypt and Tunisia. The draft final statement laid before the leaders calls on Syria to halt the shooting and "to engage in dialogue and fundamental reforms in response to the legitimate expression of the demands of the Syrian people." Moscow was in agreement with France over the need for tougher safety standards in the nuclear industry following the Fukushima Daiichi disaster, plans for which were outlined in the draft statement. Nuclear safety is high on the agenda following a March earthquake in Japan, which triggered a tsunami that killed 25,000 people and flooded the nuclear plant, plunging it into meltdown and spewing out radioactive waste water. "The United States will stand by Japan for as long as it takes for Japan to recover. And I'm confident that it will recover," Obama said, after meeting Japan's Prime Minister Naoto Kan on the sidelines of the summit. The leaders are also expected to promise new aid for the new governments of Tunisia and Egypt to encourage democratic reform following the revolts that overthrew strongmen Zine el Abidine Ben Ali and Hosni Mubarak. Britain's Cameron pledged £110 million ($175 million) to foster democracy in the region -- and Sarkozy is expected to push his partners for more. Meanwhile, amid a slew of bilateral discussions, Russia and France finalised a deal for Paris to sell four powerful modern amphibious assault ships to Moscow, in a move that may worry some European and post-Soviet nations. Sarkozy said the signature would take place in a fortnight. Following their so-called "e-G8" in Paris on the eve of the summit, Internet pioneers including Facebook's Mark Zuckerberg and Google's Eric Schmidt joined the G8 national leaders for part of their afternoon session. The online industry, with backing from Washington, is opposed to plans for regulation, but Sarkzoy is pressing for the G8 statement to at least confirm that government has a role in controlling illegal content on the web.